Life must have been so much simpler in ‘The Olden Days’. You lived in a little community and you learned which plants not to eat and which were tasty and should be picked and taken home, to be shared by the whole family. Most of this knowledge came from a relatively small number of sources. Your mother or father were probably the fount of most knowledge. Other adults in the village, suitably extended, expanded and filtered through the other children you had contact with, provided another layer, which could always be referred back to your parents. Today we are faced with the problem that, all of this mass of human creative misinformation, is easily available on the Internet. Google and I think this is Germander Speedwell. 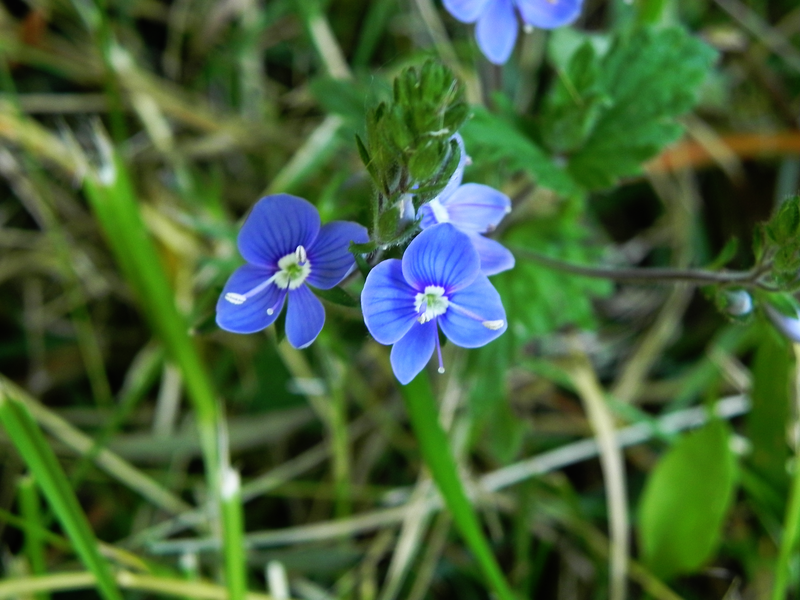 Apart from the fact that it is the commonest form of the speedwell in Britain, Google managed to find a photo that is almost identical to mine. It is also known as Birds Eye Speedwell, and I suppose, seeing those tiny bright blue specks twinkling at you through the general undergrowth, this is not that bad a name. It might be this name that led to the belief that birds would peck your eyes out if you picked it. Other people mention that this flower was once called For-Get-Me-Not, until some one, some where, decided otherwise. There is a school of thought that believes that the flowers only last a day and open in the morning, bright blue, but fade to pink or white and die by the evening. This is thought to be where the name Speed Wilt, soon corrupted to Speed Well, came from. Those who put the flowers in their shoes to protect them on a journey probably don’t know this.